Nobody likes to be stuck in a rut. For asphalt pavements, rutting is one of the most serious forms of pavement distress, and severe rutting is a significant cause of pavement failure. To prevent rutting, the pavement structure needs to provide sufficient support for the roadway surface, while the design and construction of the asphalt mix must create a pavement that can resist deformation. In this edition of the RoadReady newsletter, we’ll look at some of the laboratory test devices used to evaluate asphalt mix designs and predict rut resistance. Rutting refers to permanent deformation of the asphalt surface that accumulates in the wheelpaths. It is primarily the result of repeated traffic loading cycles. Rutting may be accompanied by fatigue cracking and other distresses, making it a serious concern and potential indicator of pavement failure. The stability of the asphalt mix is an important element in its ability to resist rutting and thus a key factor to evaluate. At the same time, however, the performance of a particular mix design depends on environmental conditions including traffic, temperature, and humidity. Since these factors are often seasonal and mix designs can be exposed to a variety of environments across different projects, this makes it a challenge to reliably predict the rut resistance of a given mix. Rutting is apparent in the wheelpaths of this street. This is one reason the Superpave mix design method does not require a specific performance test for rut resistance. 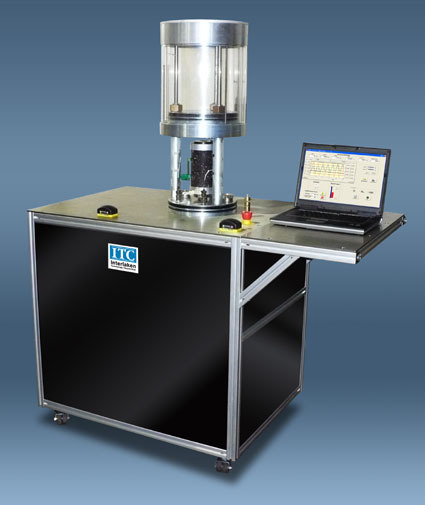 Earlier approaches like the Hveem method and the Marshall method do incorporate simple mechanical tests, such as the Hveem stabilometer or the Marshall stability and flow test, in which a load is applied and the resistance of the mix is measured, along with its displacement or deformation. Many agencies still use these established older methods to evaluate rut resistance during the mix design process. However, this is often done on a pass-fail basis without attempting to predict performance, or attempting to factor in changes in loads or environmental conditions. 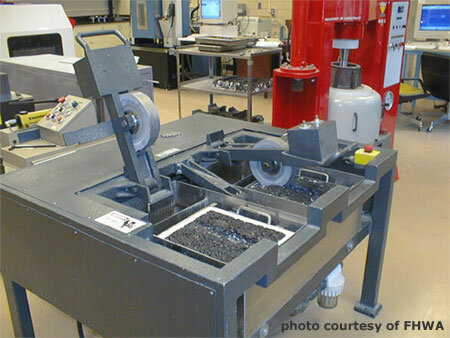 The Asphalt Mixture Performance Tester (AMPT) assesses the rut resistance of an asphalt mix based on a flow number. 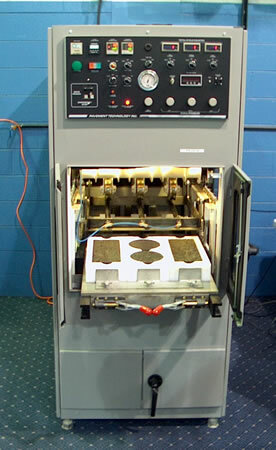 The test is conducted by subjecting a prepared specimen to repeated compressive loads at a specific test temperature. The flow number is determined by the point at which the specimen exhibits tertiary flow, which is shear deformation at constant volume (similar to the deformation that produces rutting in the field). In addition to the flow number, the AMPT can also be used to help determine the dynamic modulus of the asphalt. This property can be useful to know if you are implementing mechanistic-empirical pavement design, since it is one of the inputs for that procedure. The Hamburg Wheel Tracking Device (HWTD) tests rut resistance by tracking a loaded steel wheel back and forth across an asphalt pavement sample. 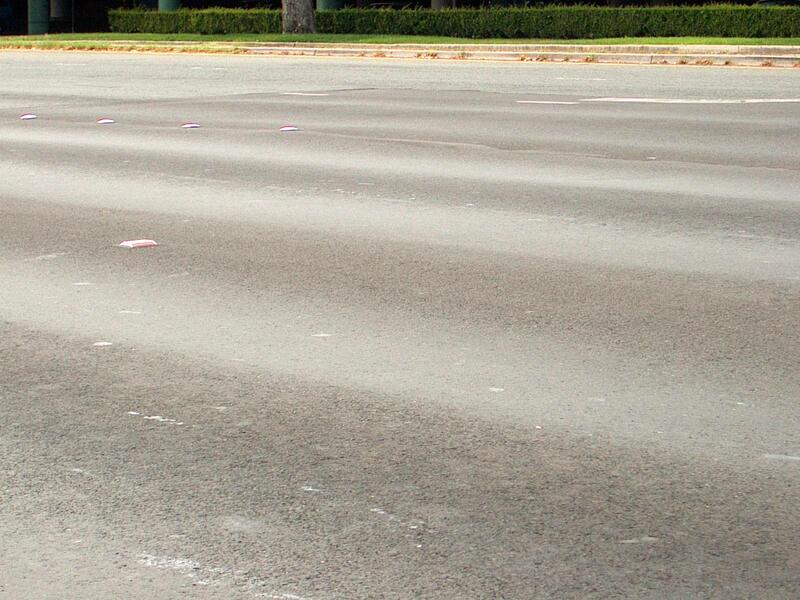 By repeating this for thousands of cycles, it simulates the effect of traffic loading on the pavement over time. The device measures the rut depth in the sample continuously during the test. HWTD testing is commonly performed on a sample while it is submerged in water. This allows it to be used to evaluate resistance to moisture damage as well. After the sample is consolidated by the initial load cycles, the rate at which rutting develops will be determined by the stability of the mix at first. Then, once the load cycles reach a certain point (which varies depending on the moisture susceptibility of the mix), rut development will accelerate as damage from stripping kicks in. The Asphalt Pavement Analyzer (APA) operates in a manner similar to the Hamburg Wheel Tracking Device but uses different equipment. The APA uses an aluminum wheel that is loaded onto a pressurized linear hose and tracked back and forth over the asphalt pavement sample. The amount of rutting is measured after the wheel has been tracked for a set number of cycles at a constant load and hose pressure. When evaluating an asphalt mix design, ideally we want to know not just its physical characteristics, but how it will perform as well. Resistance to rutting is a critical part of performance in the field, and testing for it is an important consideration. Increased experience with these devices, and ongoing research to connect their test results with empirical pavement performance, will make it easier to adapt testing to local conditions so that the results have more predictive value. With asphalt pavements, the solution isn’t to simply get out of the rut, it involves creating mixes to prevent ruts from happening in the first place. Does that mean rutting resistance is needed to be taken into consideration when designing with Superpave? Does any of these methods approved by AASHTO? Rut resistance is not specifically taken into account by Superpave because there is no single volumetric property associated with it, but these tests are a way of considering it in conjunction with a Superpave mix design. All of these devices have one or more AASHTO test procedures associated with them. Q1. What is the effect of various temperature with appropriate PG on the performance of HMA such as (RA) in particular under hot arid weather? Q1. Can I measure the rutting depth in HMA at the lab under different temperature and load traffic within the period of design life? if it possible please sent me video show the steps. I was performing a rutting performance test on what I know is a poor performing asphalt mix, but I unexpectedly obtained results indicating it is an excellent rut resistant mix. What are potential reasons why I received a “false positive” test result.